a) Admire her goal at achieving popularity on social networks. b) Decide that you too would like to be part of the “100 club” and ask if there are adult members? c) Sit her down and talk to her about the fleeting, meaninglessness of popularity in general, and on Facebook/Instagram in particular. d) Get rid of her Facebook/Instagram accounts. Another conundrum faced by our digital daughters. As girls enter their tweens and teens, friends become the end-all, be-all of social life. And, when you put smartphones – and the social networking channels that ride on their backs – in the mix, you enable a powerful, sometimes insidious, level of social phenomena. 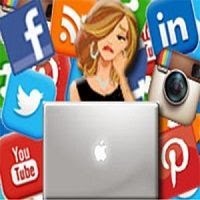 Yes, social networks are great when they facilitate new connections, a sense of community and empowerment, but the angst that can ensue when it comes to a post with a mortifying lack of “likes” and that awful feeling of being left out, can turn a girl inside out. Truth-be-told, even this (seemingly) well-adjusted 40-something mom can relate. Although I enjoy being part of the Facebook community, and the updates my friends and family deliver in their posts – along with targeted news of the TV series “Selfie” being canceled, John Stewart and Stephen Colbert’s challenges with lampooning the democratic losses, and that a squirrel and cat can play together – when it comes to posting, the potential lack of “likes” can bring me back to my anxiety-ridden middle school days (yes, that was me, unflattering glasses, pimples, and the label of theatre nerd and “bando”). We may not want to admit it, but kids and adults alike; we all worry about our exposed popularity. But our kids, and especially our ultra-connected, impressionable and delicate digital daughters bear the biggest burden. As parents, we need to constantly offer perspective and model good behavior. We read and hear a lot about what experts, advocates and researchers think about tweens/teens and technology — but maybe it’s time to ask the girls themselves? I have begun cultivating an impressive team of “Digital Daughter Ambassadors” – a group of girls of all ages and from around the country – to offer their insights on what it is like to grow up in our digital culture with its ever-changing host of social networks, devices and apps. For this post, I queried my “Digital Daughter Ambassadors” about Facebook and Instagram and how the number of followers and “likes” can affect a girl’s perceived popularity. These girls are eloquent, thoughtful and perceptive. And they give me great hope for our future generation of digital natives. In upcoming posts you will hear more from them (and their parents), and together we will learn from their wisdom, challenges and mistakes. As for the answer to the multiple-choice question above, I would choose C. What would you choose? Please post your answers below in your comments!